My name is Chris Holmes, and ‘Stickey’ has been my nickname for many years – since long before I ever even thought about keeping bees! I have always enjoyed nature and the outdoors, and am lucky to live on a little smallholding, where we grow our own fruit and vegetables, and keep a few chickens and some of our bees. I initially became interested in keeping bees as a hobby in 2004, while still working full-time for DEFRA. I joined Leeds Beekeepers Association and took an introductory weekend course, and was completely hooked! I then went on to take a further course run at Woolley College by Wakefield Beekeepers Association, and my fascination with bees just kept on growing. I was very lucky to meet and become friends with 2 local very experienced beekeepers, Mike Mee at Middlestown and Robert Bolton at Nostell Priory. Mike and Robert both allowed me to work as an ‘apprentice’ in their beekeeping businesses, and this gave me the fantastic opportunity to learn directly from beekeepers with many years experience of commercial beekeeping. I learnt so much from this, as it gave me the chance to see different approaches to beekeeping and how to work in harmony with the bees. I also learnt that bees don’t read beekeeping books or go on courses, which means that they do exactly what they want to do, which isn’t always what you expect them to do! As friends and neighbours began enquiring about buying honey produced by bees at our home apiary, ‘Stickey’s’ began to grow. Our 2 hives became 4, then 8, then 16, and before long it became obvious to me (and everyone else) that I really wanted to work as a full-time beekeeper. I took a leap of faith and left DEFRA in 2008 to pursue my dream. Since then ‘Stickey’s’ has continued to grow. I am now a member of the Bee Farmers Association and have more than 100 colonies of bees to look after. My hives are mainly sited on local farms and are surrounded by a multitude of different flowers, hedgerows and trees, which provide forage throughout the year for my bees. 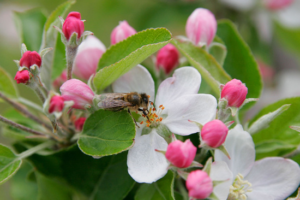 For me personally, ‘Stickey’s’ is not really about the honey, it’s all about the bees – their health and wellbeing, their social structure and behaviour, and just the real ‘buzz’ and feeling of satisfaction I get every day I spend working with them. I feel very lucky to have that privilege.